On a Tuesday evening, a graying man hobbles out of the cold wind and into Copper Creek, a local pub in Athens, Georgia. He discusses his latest record collection additions with a neighboring bar patron. The man takes a gulp of his brown ale and proceeds to stroke his fluffy white beard in efforts to wipe away any lingering beer foam. Leaning back against his chair, he stretches his suspenders out in front of him and they snap back against his protruding beer belly. The man has a warm presence about him, always smiling at passersby and saying hello to friends as friends come along. Given his appearance and charming charisma, it is nice to imagine everyone around him anxiously waiting for him to let out a “ho ho ho!” and make us all believe in Santa Claus again. In reality, however, this man is not Santa Claus, but a man named William Orten Carlton, or “Ort” as most people know him. His welcoming nature, habitual visits to local pubs and active involvement in the community have made Ort a local celebrity to the city of Athens. “I found a new record player at the thrift store last week,” Ort begins, “It was pretty battered, so I had to fix it up a little. Then, I got my oldest, most destroyed 45 and put it on and it played perfectly. I hugged and caressed the player. My new baby. My new baby.” Ort hugs the imaginary record player in his arms, smiling animatedly as he talks. Ort can carry on about records to anyone who will bend their ear to him; he talks especially about garage bands and oldies, his personal favorite genres. In the 1970s, Ort attended UGA and discovered WUOG 90.5, the campus student-run radio station. For the past 42 years, he comes into the station and shares random findings from his record collection for his DJ shift. He is determined to make it to a 50-year DJ anniversary. Discussing his upcoming DJ shift to himself, he ponders what records he will play this time. His record collection is so vast that he hasn’t even had a chance to listen to all of his records himself. Records are not the only thing Ort can ramble and write about. The controversial discussion on beer laws in Georgia is one he actively participates in, especially as he drinks a glass of local craft beer. According to the Georgia Craft Brewers Guild, the main issue Georgia breweries face regarding beer laws is the ability to grow as a small business. With current governmental restrictions, breweries are unable to sell unlimited merchandise for customers to take home. Only able to offer varying tour prices, Georgia breweries have little ability to expand as small businesses since they cannot market in-house sales of products. Ort, who always gives an ear to the “little guy”, makes sure his stance against these laws is clear. “I like to drink beer, and I like to write about beer,” Ort declares in a simplistic, matter-of-fact manner. He fans through the worn pages of his yellow legal pad, which contains various scribbles of blue, red and green ink. The pages fall together, and he stops to point out a recent description he wrote about an India Pale Ale beer. The dim lights in the pub aren’t too fond of late-night reading and writing, and Ort squints to make out his own penmanship. “My favorite type of beer would have to be an India Pale Ale with at least 5.6 percent ABV. It’s gotta have that bite to it, or it’s just a pale ale to me,” Ort shares, “My favorite IPA is only found in Kentucky, in a small town that still does not allow beer sales on Sunday.” He goes on to discuss local religious influence on beer laws in Kentucky, opening a door into the vast facts he knows about craft beer. While he does participate in craft beer discussions in Athens, his knowledge of craft beer culture extends throughout the southeast. John Gayer, the brains behind the beers of Copper Creek Brewery, walks by where Ort is seated at the bar and pauses the beer culture discussion to say hello. Pointing at Ort, Gayer says, “He is an interesting man with a heart of gold,” and it seems as though the whole city of Athens nods in agreement. To Athens, supporting local businesses is a priority; the city thrives off the pride taken in local culture and talents. While Ort may seem like a mere creature of habit, his frequent visits to local pubs and decades of involvement in the local music scene are more than just routine. Through his commitment to personal passions regarding craft beer and local music, Ort has formed a family that weaves through a diverse range of individuals. Gender, race and even political opinions are invisible to him when it comes to making friends; Ort has never been one to discriminate against any minority. By now, the night grows darker at the local pub, but Ort remains at the bar with what seems like a bottomless beer glass. Behind the bar, a small sign reads “Good job, Ort!”, a clue that the night is still young for Ort. His eyes, now weighted by the past few beers, squint in a winking manner as he peers over the frames of his glasses. After a few more beers and his favorite 60 cent chicken wings, the sign is flipped over to say “Slow down, Ort!” Slowing down could be arguably one of Ort’s most exquisite talents, but not in the sense of beer drinking. 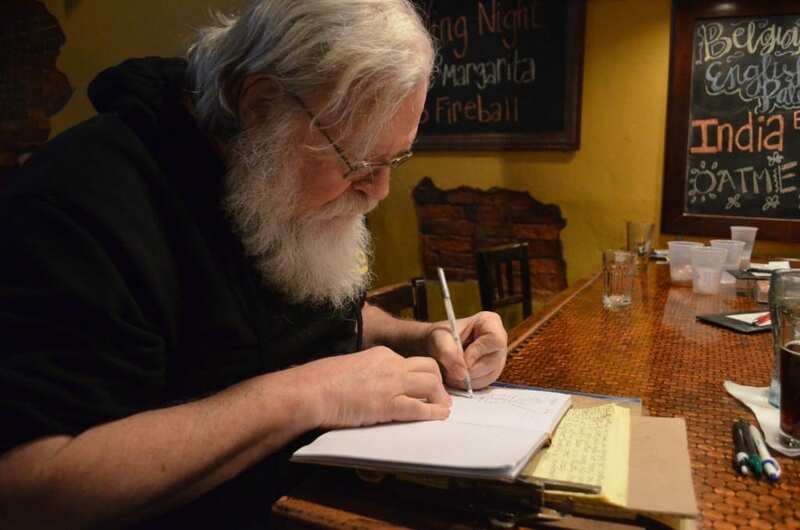 Between his scribbles on a yellow legal pad and his occasional fumbling attempt to text on a small flip phone, Ort’s life itself is pleasingly easygoing and old fashioned. Ort loves Athens, and the city equally returns the love to him. Whether he is perched at the bar of Copper Creek Brewery or at Trappeze Pub, another local place of habit for Ort, his diverse, self-created family members always stop by to say hello. Ort loves without limits, and it shines through Athens in the way he unites people of all ages, races, and backgrounds.